Red Rake Gaming, the current leading videoslot and casino game developer, has just announced its latest creation: a 6x10 reel fantastic videoslot brimming with awesome features and millions of prize modes. 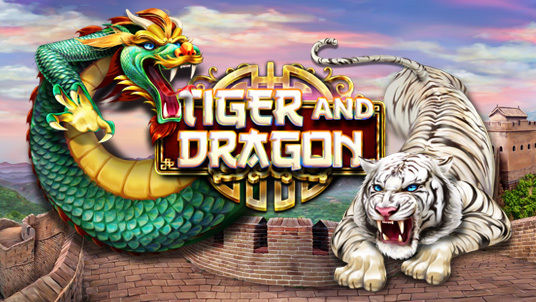 Players challenge a powerful white tiger and a fearsome dragon with each spin in order to get hold of all the prizes they guard in ancient China. Tiger and Dragon is an extremely dynamic videoslot where the awarded symbols shift down following each spin, triggering a re-spin and giving way to new symbols. The climax of the game is the free spins phase where the player can obtain endless multipliers that increase with each re-spin. If the free spins phase total prize is lower than x10, the player gets six additional spins. Non-winning spins also receive prizes, accumulated as a percentage that grows in the additional side panel, activating the ‘Tiger and Dragon Roulette Minigame’. This new videoslot will be showcased from February 5th to 7th at the great ICE Totally Gaming event in London where Red Rake Gaming will be present at Stand N9-325.